Family Man: Jerry Tuttle ’90 made sure he carved out quality time to spend with his wife, Stephanie Rose Tuttle ’92, and their two daughters. 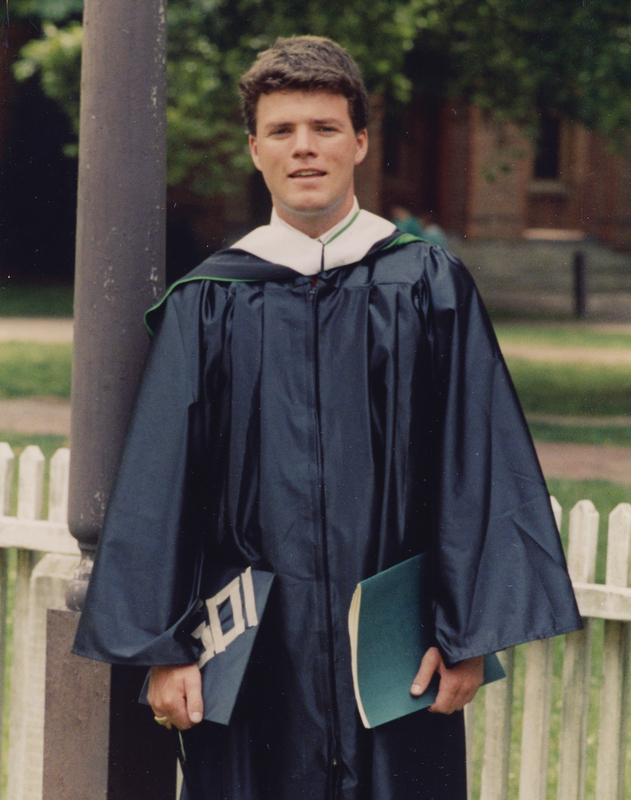 Gerald “Jerry” L. Tuttle Jr. ’90 was 28 years old and nervous about relocating from the East Coast to San Francisco to continue his career in investment banking. At the time, he perceived San Francisco as a big city full of strangers — surprisingly intimidating to the native New Yorker. But his mother reminded him of his greatest strength: his ability to make friends. She assured him that he would know everyone in the Bay Area in a short amount of time. She was right. As usual, Jerry made fast friends and soon called San Francisco home. Jerry’s parents, Mary Jo Tuttle and Gerald “Gerry” L. Tuttle Sr., say their son utilized his business acumen and natural ability to make friends and harness relationships to reach the highest heights of the investment banking world. 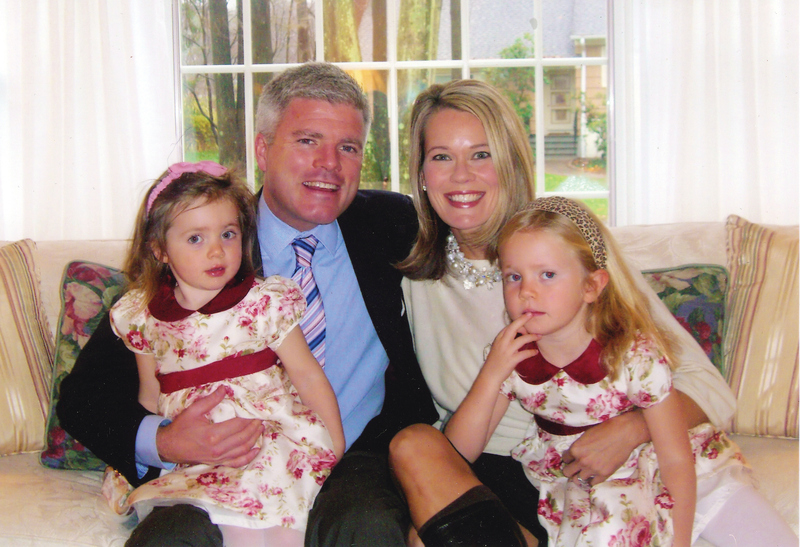 But in January 2007, Jerry’s life was suddenly cut short, leaving behind his beloved wife, Stephanie Rose Tuttle ’92, and their two children, Abby and Avery. In a time of deep grief over the loss of Jerry, his parents and Stephanie wanted to do something that would bring joy to the lives of others, including their own, by creating a William & Mary scholarship in his name. The Tuttle family feels an enormous sense of pride that in just 10 years, since the Gerald L. Tuttle Jr. Scholarship Endowment was established, seven students have been afforded innumerable opportunities to pursue their passions. The Tuttle scholarship recipients are: Jonathan Converse ’10, Patrick Welch ’11, Benjamin Choi ’13, William Smith ’14, Jakob Deel ’16, Emily Wasek ’17 and Peter Makey ’19. FRIENDSHIP The students say the Tuttles’ generosity does more than ease the costs of their William & Mary education. It is wrapped in an unexpected friendship with the couple that often includes golfing, cooking or sharing a meal at a local restaurant. Jonathan Converse ’10 was the first recipient of the Tuttle scholarship. Converse, an Arizona native, says that while the scholarship made a significant impact financially, he also appreciates the friendship he shares with the Tuttles. GENEROSITY: The Gerald L. Tuttle Jr. Scholarship Endowment serves as a tribute to Jerry’s life and fosters educational opportunities for its recipients. Jerry grew up in Westchester County, New York, the youngest of two children. His father says even as a child he was a people magnet who never lost a friend. An avid swimmer, he was a government major at William & Mary who pledged Lambda Chi Alpha. After spending a few years on Capitol Hill as a legislative clerk, he soon developed an interest in investment banking through his sister, Tracey, who also worked in the financial field. In 1999, he became a founding partner of JMP Securities. At the time of his death he was the co-president and chief operating officer of JMP. LEGACY Emily Wasek ’17 was the first female recipient to receive the scholarship. The scholarship was initially for members of Lambda Chi Alpha fraternity and government majors. Now it’s open to all juniors and seniors who are government majors. Wasek worked three jobs to help fund her education. She says thanks to the Tuttles’ support she was able to reduce some of her work hours during the school year. “With the Tuttles, its not just a scholarship that you get, it’s also an understanding of community and what it means to carry a legacy,” says Wasek, currently a fellow at the Jacksonville Speech & Hearing Center in Jacksonville, Florida. Peter Makey ’19, a member of William & Mary Men’s gymnastics team, is the current Tuttle scholarship recipient. Will Smith ’14, also a Tuttle scholarship recipient, funded his first trip to Liberia, Africa. That trip led to him starting the Monrovia Football Academy, which combines education with soccer to motivate students. He too remains in close contact with the Tuttles. NEVER FORGET JERRY When Jerry passed away, his colleagues at JMP created a book of reflections and photos of various moments in his life. Each scholarship recipient is given a copy of the book to read. In it, Jerry is described as having a unique way of making people feel special. One writer says that Jerry “collected friends” and that everyone at his funeral probably considered themselves his best friend. Others wrote messages directly to Jerry’s two daughters, who were 5 and 3 when their father died. One person wrote that Jerry spent every free moment he could with them. The writer told them that their father enjoyed pushing them endlessly on the playground swings in San Francisco’s Marina District. On the final page of Jerry’s book are simply the words, “Never forget Jerry Tuttle.” His parents’ generosity is helping to ensure those words live on forever. To support the Tuttle Scholarship Endowment, please mail your check to the William & Mary Foundation, P.O. Box 1693, Williamsburg, VA 23187 or give online at online at impact.wm.edu/tuttle.